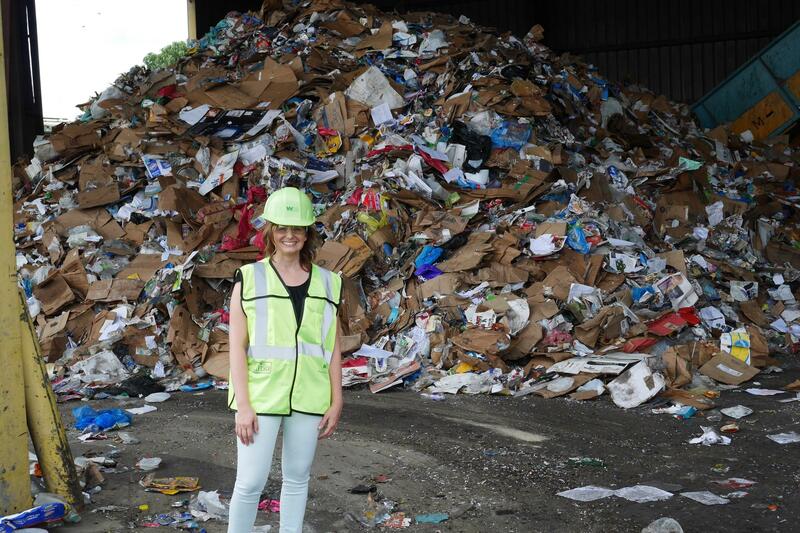 Erika Young, from Waste Management, in front of a pile of recycling on the tipping floor at the company’s Materials Recovery Facility (MRF). The global market for recycling has changed dramatically over the last year, and it’s already trickling down to what happens at the curb. China used to take all sorts of foreign recycling because it was using the materials to build its economy. But at the beginning of this year, China stopped importing most plastic waste and mixed paper, like junk mail. That’s because of its National Sword Policy. The country has its own trash problems and China will only accept a prohibitively low amount of contamination in the materials it still takes. Just 0.5 %. It’s really tough for recycling operations to comply with this. First of all, not all plastic is equally valuable. Take, for example, plastic marked #1 on the bottom, like the kind strawberries come in - is PET or polyethylene terephthalate. That’s also a type of plastic found in soda and water bottles. But those bottles are a lot more valuable than food containers. They can be cleaned and melted down to make more bottles, or other products like carpets. But that’s not what happens to a lot of other shapes and numbers of plastics. Some are burned for fuel, but some are also just ending up in the trash. Erika Young works in public relations for Waste Management Inc.
She recently took me on a tour of a recycling facility in Pittsburgh. We wore hard hats and watched a parade of bottles and bags as they moved from a pile three times our height on the tipping floor, up a belt to a platform where they’re sorted by hand. Below the line are residue bays where items that can’t be recycled are dropped. She says China’s new policy leaves sorting facilities with few options. “If we don’t have a market to sell this material, it essentially is not recyclable,” she says. In the sorting facility, Young and I watched workers pick out things that could hurt the machines, from plastic bags to garden hoses. We even saw a bowling ball. I asked her what happens to something like a plastic container for strawberries. “Your strawberry clamshells might not be in this refuse pile. But before they get to the end bailing, they will probably end up in a refuse pile,” she says. Young says later on down the line, the cardboard and paper material are sorted with a sizing screen. The paper rolls over the top because it’s flat. But those flimsy, plastic berry containers also fold flat, so they could end up with the paper. Young says that’s contamination, and it’s a bigger problem now. So what are recycling companies doing? Recyclers are reluctant to talk about this, first, because their markets are kind of trade secrets--individual businesses don’t want their competition to find out if they have a niche market for a certain material. But they are sending some plastic residue they can’t sell to landfills, and some places are storing the material on site. Anne Germain is Vice President of Technical and Regulatory Affairs with the National Waste and Recycling Association. “We understand why China is doing this, but the timeline that they set for it was so short, it didn’t allow for alternative markets to develop,” Germain says. Germain says even the alternative markets in Asia, like Vietnam and Thailand, are turning away foreign recycling because they’re overwhelmed with the surplus. Building similar facilities in the U.S. will take time and investment. Germain says recycling companies are getting squeezed. The cost of doing business is higher because they have to pay to send more material to the landfill, and they’re getting less money for material they can still sell. Those costs will eventually be passed on to their customers. Here in Michigan, experts say we’ve been a bit insulated from this policy change in China - until now. That’s because we have more markets for recycled materials in the Midwest. Kerrin O’Brien is the executive director of the Michigan Recycling Coalition. “There are many smaller materials recovery facilities in Michigan that do try to place their materials locally; find local Michigan or Midwest markets for their recyclables,” she says. O’Brien says recycling companies on the East and West coasts tend to ship material overseas. And as Michigan Radio’s Stateside reported, some places in Michigan are already planning to charge residents more for recycling. Kerrin O’Brien says recycling facilities are also having to slow down their processes. How does all of this affect what we can put at the curb in our recycling bins? O’Brien says so far, she hasn’t seen any changes in what Michigan communities are accepting for recycling. She says the best thing to do is to check with your city or town to see what they accept at the curb or drop-off center. She says for example, you can recycle plastic bags at some grocery stores, but if you put those in your curbside container, they can get wrapped around equipment at the recycling plant. There is a lot of concern over what to do with the plastic water bottles we use. Flint is one community that is grappling with this question in a big way. In the wake of the water crisis, the city has had to rely heavily on water bottles for safe drinking water. Ali Rose Van Overbeke, a metro Detroit native, founded Genusee to turn that waste into eyeglasses, manufactured by Flint residents.